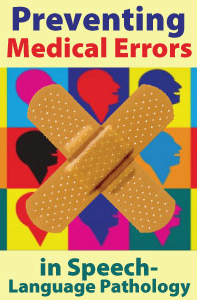 Over the past 20 years, medical errors that result in patient injury or even death have become the focus of attention in both popular and professional publications. The Institute of Medicine (IOM) defines a medical error as: “The failure to complete a planned action as intended or the use of a wrong plan to achieve an aim.” Medical errors – which can occur in either the planning stage or the execution stage – are frequently communication errors, which are, unfortunately, very common in health care. In the State of Florida, speech-language pathologists and other health professionals are required to complete a course on the prevention of medical errors each time they renew their license. Preventing Medical Errors in Speech-Language Pathology is designed to help SLPs be vigilant to the kinds of medical errors that can occur in their practice and take proactive steps to prevent them. This course addresses the impact of medical errors on today’s healthcare with a focus on root cause analysis, error reduction and prevention, and patient safety. Multiple scenarios of real and potential errors in the practice of speech-language pathology are included, along with recommended strategies for preventing them. Evidence shows that the most effective error prevention occurs when a partnership exists among care facilities, health care professionals, and the patients they treat. Suggested strategies for preventing errors address all three elements: (1) models for changing the culture in care facilities, (2) lifelong learning for SLPs that is focused on ethical, evidence-based, culturally competent practice and (3) tools for educating and empowering patients. * This course satisfies the medical errors requirement for biennial relicensure of Florida speech-language pathologists and audiologists. Course #20-77 | 2013 | 35 pages | 21 posttest questions | ASHA credit expires 4/20/2016. One the most common medical procedures in which speech-language pathologists have a primary role is the evaluation and treatment of swallowing and feeding disorders. Because of the nature of swallowing disorders, treatment is frequently complex, and a number of dysphagia management issues have become very contentious. In addition, the potential for error, adverse outcomes and litigation is significant. Preventing Medical Errors in Speech-Language Pathology also includes a section on race and ethnicity. The authors point out that there is an increasing need for bilingual health professionals to serve the rapidly growing ethic segments of our population. According to the U.S. Census Bureau (2012), minorities comprise 37% of the U.S population. When professionals are not familiar with the cultural norms, customs, and languages of their patients, miscommunications can arise and cause serious diagnostic and treatment errors. Use plain, nonmedical language. Explain things as you would to your own grandmother. Show or draw pictures to help your patient understand and remember. Limit the amount of information provided, and repeat it. Use the “teach-back” technique to confirm that the patient understands. Create a shame-free environment by encouraging questions. This entry was posted in CE Courses, Speech-Language Pathology CEUs and tagged ASHA, CE, CEUs, continuing education, FL, Florida, Health, Medical error, Medical Errors, Medicine, Online Courses, Preventing Medical Errors in Speech-Language Pathology, Professional Development Resources, SLPs, Speech Language Pathology by Gina Gunderson. Bookmark the permalink.